In these times, I am so grateful for PI. You all strengthen and sustain my efforts toward a less authoritarian and more egalitarian state. I’m hoping that PI fulfills this purpose for you too. As we created the guidelines a long while ago, it might be time to remind ourselves why we are here, why we do what we do, why we sacrifice our time, money and energy. Resist any agenda which includes racism, sexism, authoritarianism, and corruption, which is the agenda of the current administration. Focus on local, defensive congressional advocacy. We demand that our own local and statewide Members of Congress serve as our voice in Washington, DC. Support the rule of law, the Bill of Rights, and the Constitution, and stand united in opposition to any individual or group that might erode or violate them. Embrace progressive values. We model inclusion, respect, and fairness in all our actions. 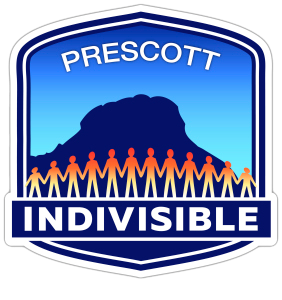 Prescott Indivisible works to defend progressive and inclusive values at every level of government. We refuse to accept divisiveness through hatred and fear. While we come from varied backgrounds, we work compassionately to build consensus within our group. Our diversity is our strength. We focus our energy on our sphere of influence, where our efforts can be effective. Trump is an authoritarian, and his administration is pursuing policies that aim to destroy our democracy and our civil rights. We stand indivisibly opposed to Trump and those who would support and further his agenda. If anyone would like to meet for coffee to learn twitter or just to figure out where and how you fit in, let’s have a coffee! Our strength is our commitment to change and to one another. Thank you all for showing up the way you always do!